In Secret Server password management software Unlimited Administration mode is an emergency feature designed to allow an administrator access to all Secrets and Folders in their Secret Server instance without explicit permission. Also known as ‘Break the Glass’, this feature is used when emergency access is needed to a Secret – a firecall password – or when company policies require administrators to have access to all information in the system. By using Role Based Access Control (RBAC), the Unlimited Administration Mode can be set up so that two people must agree before the feature can be used. 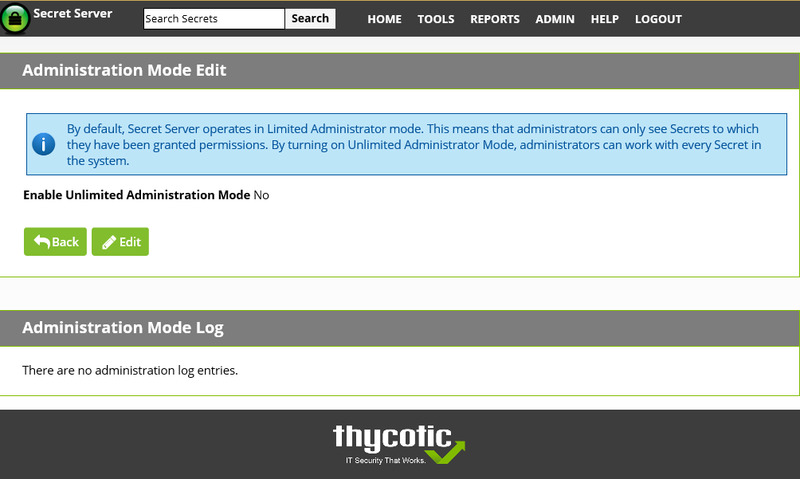 Unlimited Administrator Mode is audited within the system and an automatic email alert can be sent through Event Subscriptions whenever the feature is accessed. Try Secret Server FREE for 30 days via the form on the right, or check out Secret Server’s other user-friendly features.